> A REAL Action Plan That Works! 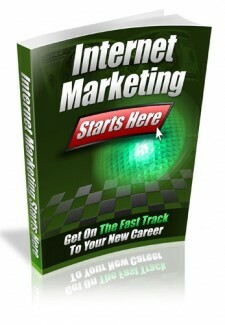 Welcome to the ‘Internet Marketing Starts Here’. I have created this book to show and teach you everything that you could ever need to know about starting your first money making online business. In order to do that, I am going to assume that you are starting from a completely blank piece of paper (or an empty computer screen) and that, at this point, all you know is that you want to start earning money from the Internet. Maybe at this stage you are really only interested in knowing whether it is possible to earn money on the net, and you have not fully made your mind up yet whether it is for you, or not. That is fine, and only to be expected. Like moving to a new town or changing your job, you can only ever really know whether trying to make money online is for you or not once you try it out. But, before we go any further, here is the first lesson that you must learn about starting an online business.